When it comes to buying a swing set there are a LOT of options. They come in a variety of sizes, different materials, a wide range of prices, and with numerous accessory options. Unless you know exactly what you want, choosing the right swing set can be an overwhelming task. Almost as overwhelming as choosing the right swing set is deciding where to purchase the swing set. Again, there are a LOT of options. If you’re shopping for a specific brand or style of swing set, you will quickly find that the one you want is only available at certain retailers, either in-store or online. The decision will more than likely come down to the place that can provide the best price and exceptional service. If you’re not picky about the type or brand, but would rather choose from a certain retailer, you may find that you’re limited in your choices. Whether it’s because you want to shop somewhere local to get personal service or you’ve found a great sale or coupon somewhere, limiting the place to purchase a swing set very quickly limits the styles you can choose from. In most cases, however, if you’re willing to wait, many stores can order exactly what you want. There are, of course, advantages and disadvantages to any location you choose to purchase a swing set. Choosing a place typically comes down to your own personal shopping preference. Do you want to see a product before you buy it? Are you looking for the lowest price? Are you willing to wait for a product or do you need it immediately? Will you need someone to install the swing set or will you do it yourself? Below you will find a list some of the most popular types of places to purchase a wooden swing set. Hopefully the outlined advantages, disadvantages, and store examples will help you to make an informed decision before making your purchase. A “big box” store is a retail location that is actually big and box-shaped in its appearance. They are usually a chain that can be found anywhere in the country. These stores can also commonly be referred to as a “supercenter” or “megastore”. Big box stores typically sell a wide variety of items and do not specialize in just one type of product. They are popular because they provide a one-stop-shop where you can find everything you need in one location. Most big box stores also sell their products online. 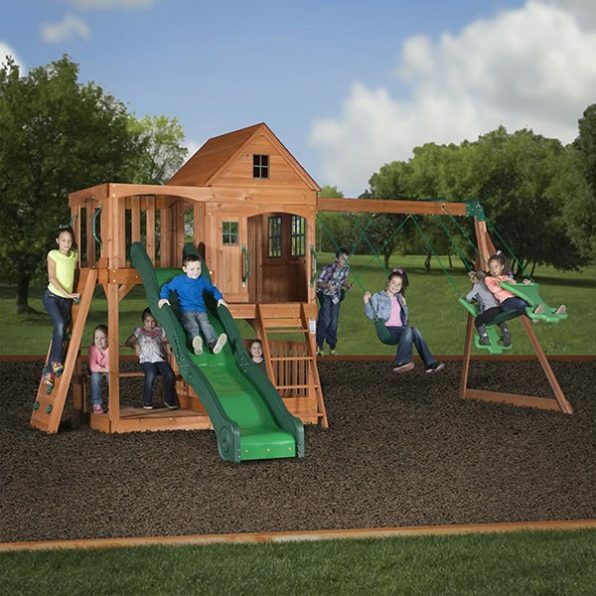 While not all big box stores are an option when it comes to purchasing a wooden swing set, many of the most popular stores do provide a selection of swing sets. When you think of popular online retailers you should think of the websites you visit most often to purchase anything from food to toys to everyday household items and everything in between. When you can’t find it anywhere else these online retailers are the places you go to find exactly what you need, including a swing set. Many of these stores sell brand new products but if you’re looking for a good deal there are also popular online retailers where individuals can sell used products. There is always the option of buying a wooden swing set directly from the manufacturer that designs it and puts it together. While this seems like the obvious first choice for purchasing to many, since the manufacturer would know their product the best, there are disadvantages to choosing this option. Some manufacturers only sell their products through other retailers while only offering customer service to their product buyers. If you have your mind made up about a certain brand, then buying directly from a swing set manufacturer could be the best option. Most hardware stores that sell outdoor and building supplies usually have a selection of wooden swing sets to choose from. 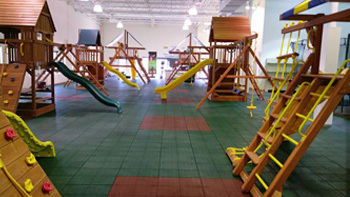 Typically, these stores will build one or two sample sets so customers can see what the wood and construction of the swing set is like before purchasing something. 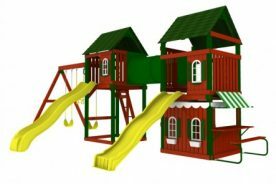 Whether your local hardware store is a chain or whether it is a true, hometown, locally owned store you should be able to shop for swing sets or at least order them. This category differs from the previous section about “Popular Online Retailers” because “Online Swing Set Retailers” refers to online stores that exclusively specialize in swing sets and outdoor products. They are also different than swing set manufacturers because they do not actually make the products they sell; they simply act as a dealer for a wide variety of swing set brands. These retailers are generally selling only products that can be found online and all of their services are done through their website. The name of these stores says it all, they are large stores that offer large discounts on products bought in large quantities as long as you have a membership. These are the stores that you cannot even walk into without buying a yearly membership and carrying a card with your photo. While most people utilize these stores for buying frequently used household items and food in bulk in order to save money, discount membership stores are also known for selling large ticket items, such as swing sets, at lower prices as well. 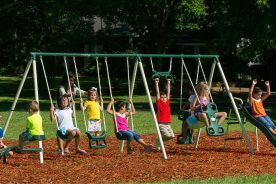 Discount membership stores typically only carry 1 or 2 models of various swing sets but some also offer these large items on their website. They are able to sell large items that a consumer would never buy in bulk at a discount bulk rate because they probably bought it in bulk from the manufacturer to begin with. 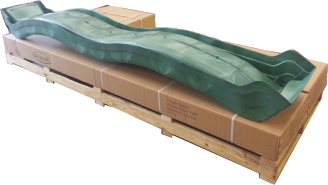 Usually products are bought in bulk so could be sitting in the store or warehouse for long periods of time. Unless purchasing online, stores will not deliver to your home. As you can see there are lots of choices when it comes to finding a place to purchase a wooden swing set. You may find that you’ll come across exactly what you want in the most unexpected place. Whether you are shopping based on brand, location, or included features, don’t limit yourself without doing some research first to find exactly what you want at the best price available.